Believe it or not, a whole lot has changed in the world of instant film in the past few years. 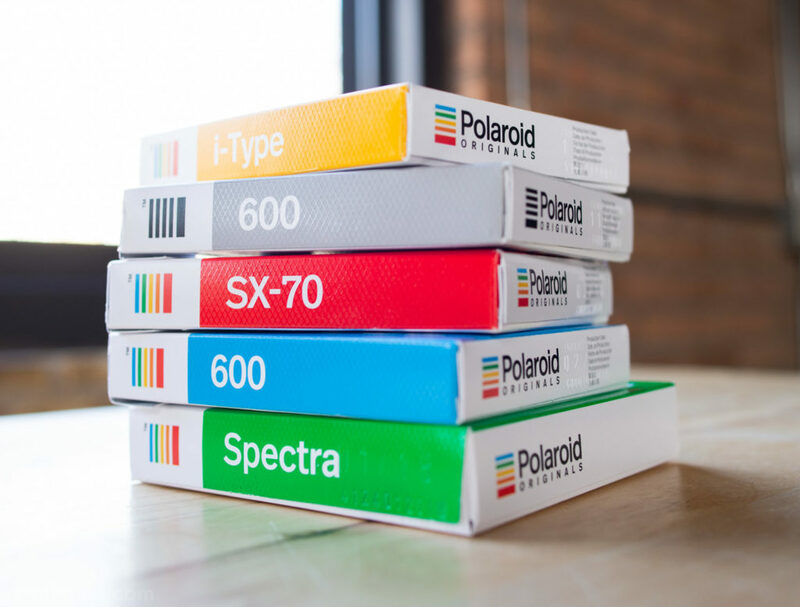 Even as digital reigns supreme, Fujifilm and Polaroid Originals has led the way as they bring us a steady stream of new formats, cameras, films, and more. It’s a great time to be an instant film shooter. With so many options out there today, I wanted to do an up-to-date comparison between all the various cameras and formats floating around. I’m not looking for the definitive ‘best’ film, as that’s entirely subjective, but hopefully these comparisons give you a clearer idea of what each camera and format brings to the table. With this test, I’m trying to suss out the subtle and not-so-subtle differences between specific cameras and film. 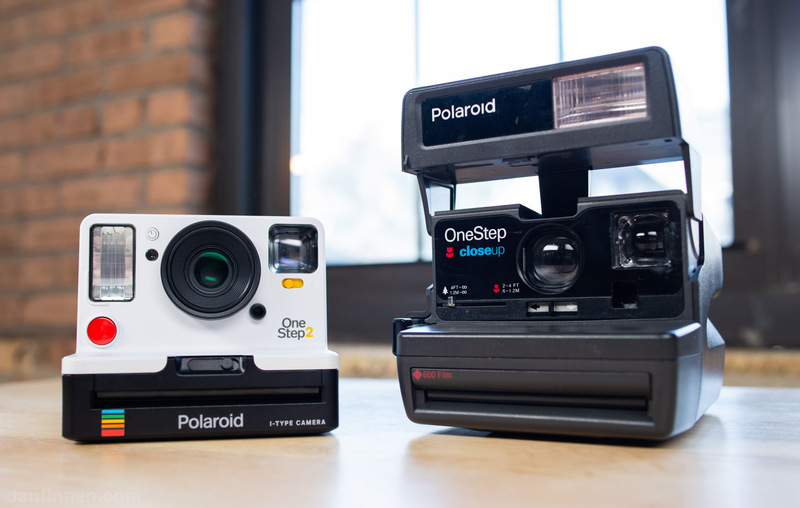 With this, I’m going to try to answer questions like: How does the new Polaroid Originals OneStep 2 compare to similar fixed-focus vintage Polaroid cameras like the OneStep CloseUp? How does Fuji Instax film treat color compared to Polaroid Originals film? How much sharper are autofocus Polaroid cameras compared to fixed focus? I’m going to provide my own analysis and really get into the weeds here, but ultimately you can make your own call. I’m providing all the test images so you can look at the data yourself. Photography is entirely subjective medium, so you may come to a completely different conclusion than me from the same information. So without any further ado, let’s jump in! Instant film stock can change dramatically with age, so I made sure to use only brand new film, all of it ordered at the same time for this test. I installed all film cartridges just before shooting to make sure the batteries were at optimal power. All film was stored at room temperature prior to loading into the cameras. Even though I have affiliate links on this site, I paid for all my cameras and film out of pocket (as I always do). I used three separate setups to put the cameras through their paces. With each setup, I took two photos, and then chose the one that came out best to include in the comparison. Between taking the two photos, I sometimes adjusted exposure compensation on the camera to get the best picture possible. I tried to stick with 2-3 photos per camera in order to remain on the same 8 image cartridge for the whole test. In this setup, the model is placed in front of a neutral dark gray backdrop, with two Kino-Flos and one large window providing continuous daylight-balanced light. I left the flash on with all cameras, as even with the amount of light I had in the room, these cameras are always hungry for more. As we’ll see in the results, the SX-70 Sonar couldn’t even find enough light to produce an image at all. In this setup, the model is outdoors on a clear, late afternoon with sunny skies. The light is directional, which creates stronger shadows than something closer to the middle of the day. 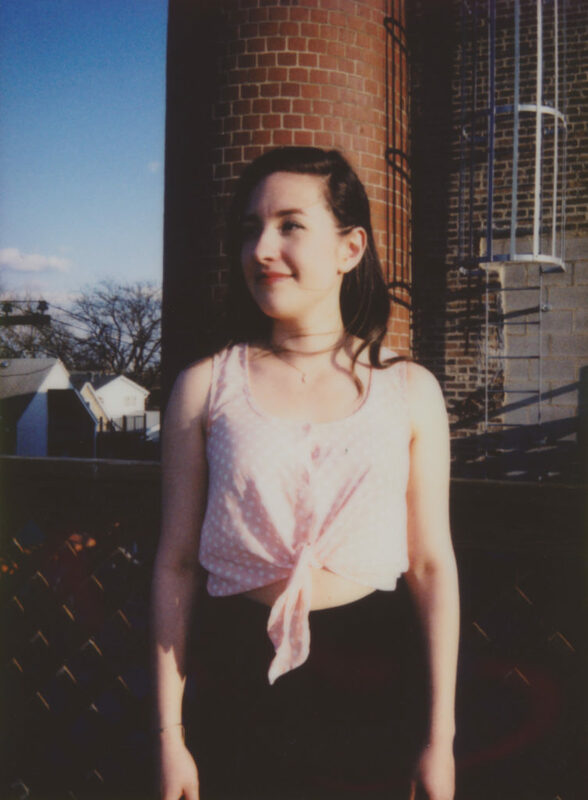 Temperature was 70 degrees, which is optimal for Polaroid film. The quality of this late afternoon light is a bit warmer than mid-day tones, but not yet the orange of dusk. In this setup, I took a picture of a large building on a clear afternoon. 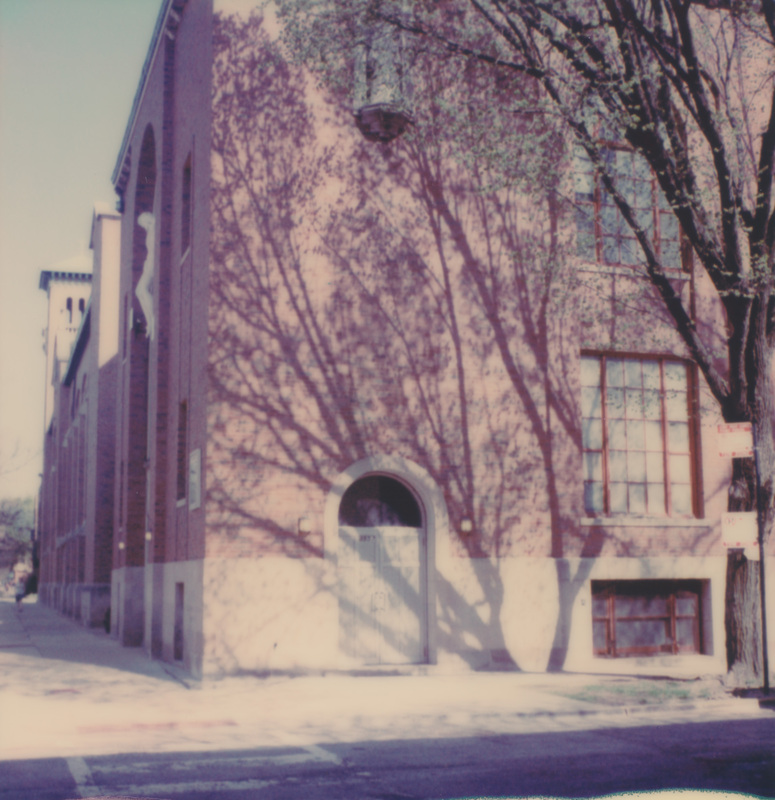 Light filters through the trees to hit the building. 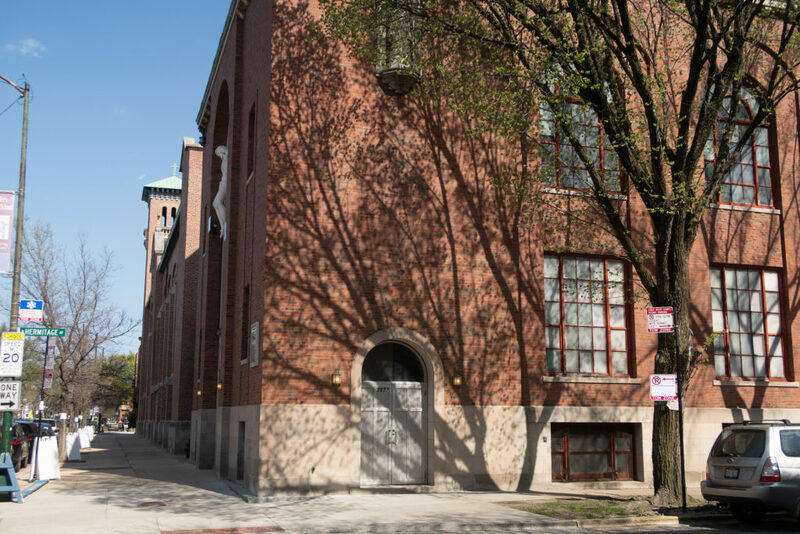 There is a wide gamut of exposure in this scene, with a bright clear sky, a directly lit portion of the building, and a shadowed street. I didn’t intend for this to be a challenging scene, but it turned out to really put these cameras through their paces. Temperature was a bit higher than when I performed the outdoor portrait test at 80 degrees fahrenheit. Because I’m testing so many cameras simultaneously, I thought it would be productive to do some direct comparisons between individual cameras and film types before looking at the big picture. I took digital pictures of the indoor portrait setup and exterior landscape setup for reference. Unfortunately, I completely spaced on getting a digital photo of the rooftop setup. I’m clearly unqualified to be a proper scientist. Also, you can click on any of the images below to see a larger version. I unfortunately can’t put the ultra-large original scans up in their full resolution, as that would crash the poor servers that run this site. Taken with a Canon G7X Mk II digital camera. Taken with a Nikon D610 and Nikkor 28mm f1.8 AF-S lens. Now that we got the digital images out of the way, let’s jump in! It’s the battle between two entry-level fixed focus lens Polaroid cameras! These both use the same film type (Polaroid 600). For this test, the OneStep 2 uses ‘I-Type’ Polaroid Originals film, which is the same as the Polaroid Originals 600 that I use in the Polaroid OneStep Closeup, except it doesn’t have a battery since the OneStep 2 has its own power. So all differences here come down to the cameras themselves. Both of these cameras are fixed focus, which means that they don’t have any autofocus units, and the lenses don’t move. This is similar to the disposable 35mm cameras of yore. The upside is that this type of lens is cheap and always ready to shoot, but it’s generally not quite as sharp as an autofocus lens. 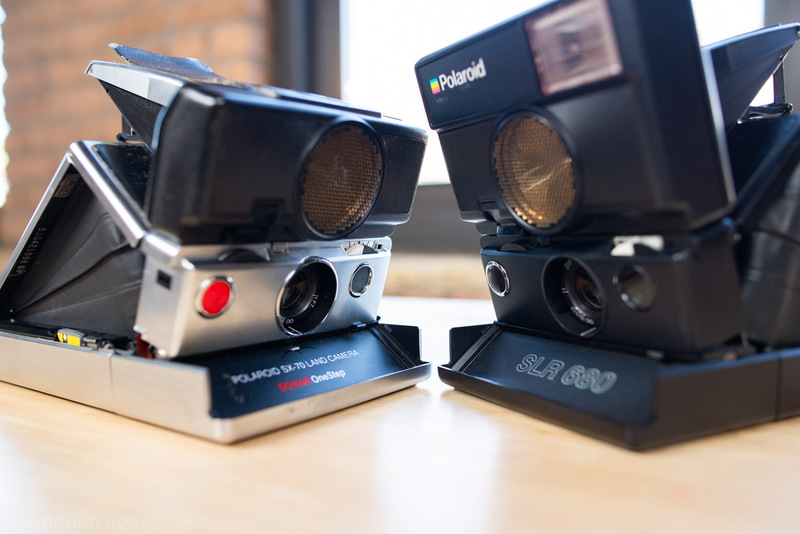 These two cameras both sit as entry points for the Polaroid system and are great for beginners. But which one is the best? In the landscape test, they both look pretty similar, but the vintage CloseUp OneStep seems a bit sharper to me, especially in the trees. It seemed to expose just a hair better as well. However, the differences are pretty negligible, and both turn in the same dreamy Polaroid Originals treatment of the scene. In the outdoor portrait test, the vintage OneStep Closeup did a terrific job, with excellent exposure and a sharp image. It’s one of my favorites of the test. The OneStep 2 consistently overexposed in this scene, with the first image being completely blown out. With both cameras the flash was on, and it seems like it may have been a hair too much in the OneStep 2’s case. 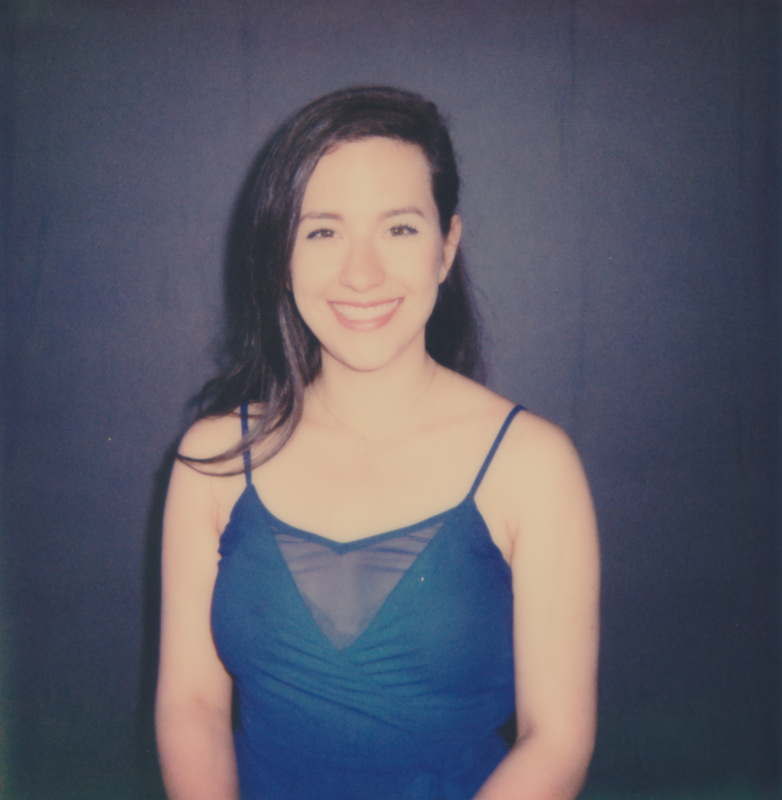 The indoor portrait setup was where the OneStep 2 shined and the vintage CloseUp dropped the ball. 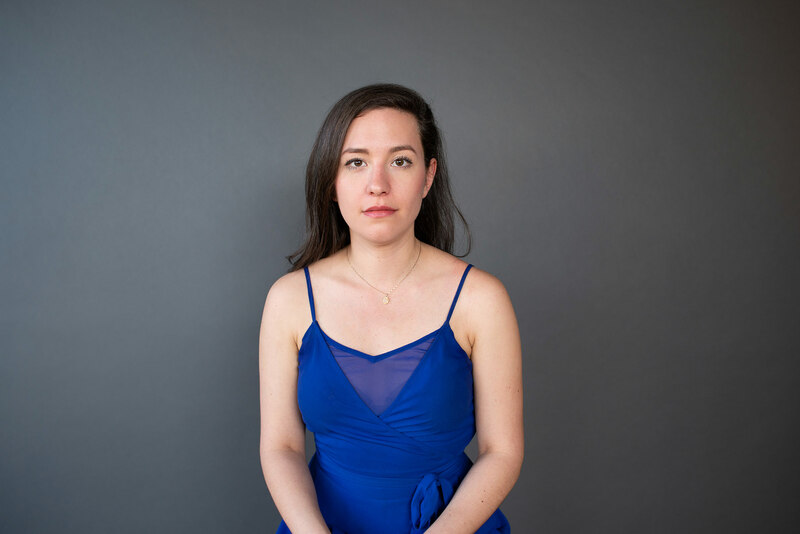 The OneStep 2 image is acceptably sharp and the flash does a good job illuminating the subject without blowing her out. 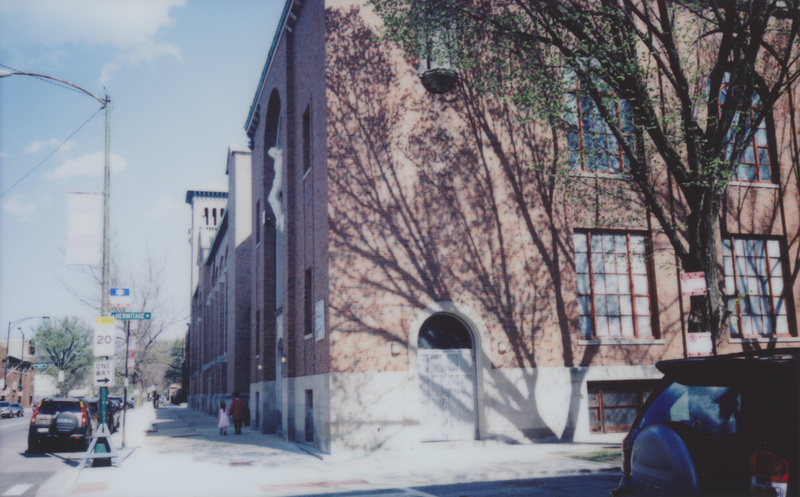 However, the OneStep CloseUp is a disaster, as its soft, overexposed, and appears out of focus. The subject was close enough to the camera that I might’ve busted out the plastic ‘closeup’ adapter, but in my experience it only blurs the image even further. Just to be sure, I backed up further from the subject and it still came out a blurry mess. One intangible thing to note is that the OneStep 2 viewfinder is intensely frustrating. All of my OneStep 2 images have lousy framing, often with far too much headroom, because the viewfinder doesn’t have a set place to put your face. It’s hard to describe, but most viewfinders have a spot where your mush your face. However, the OneStep 2 has a loose ‘window’ that doesn’t give you any precise place to look through. There’s no way to know if you’re looking through it the ‘right’ way, which makes it sloppy and difficult to use. It looks cool, but it’s a pain to use. So the verdict? OneStep CloseUp if you’re shooting outside, OneStep 2 if you’re shooting inside. On the other end of the Polaroid camera spectrum are two of the best Polaroid cameras ever made: the legendary SLRs. The SX-70 is older and doesn’t have flash, but has the great sonar autofocus unit. It also uses the lower-ISO SX-70 type film, versus the SLR 680 which uses the faster 600 type film. Both frame sizes are the same. Both of these cameras have very similar lens elements and autofocus units, so the differences will come down mostly to the flashbar of the SLR 680 and the difference between the low ISO Polaroid Originals film for SX-70 and the higher ISO Polaroid Originals film for 600. In the landscape test both cameras look nearly identical. Exposure is good, with neither the shaded or bright areas blown out. The image is sharp, with no obvious distortion. The one major difference I can tell is that the SX-70 Sonar image is a bit cooler (and true to life) than the SLR 680 image. My guess is that this difference may point to 600-type film being a bit more susceptible to warm environmental temperatures. In the outdoor portrait test, we see a much bigger difference between the two film formats. 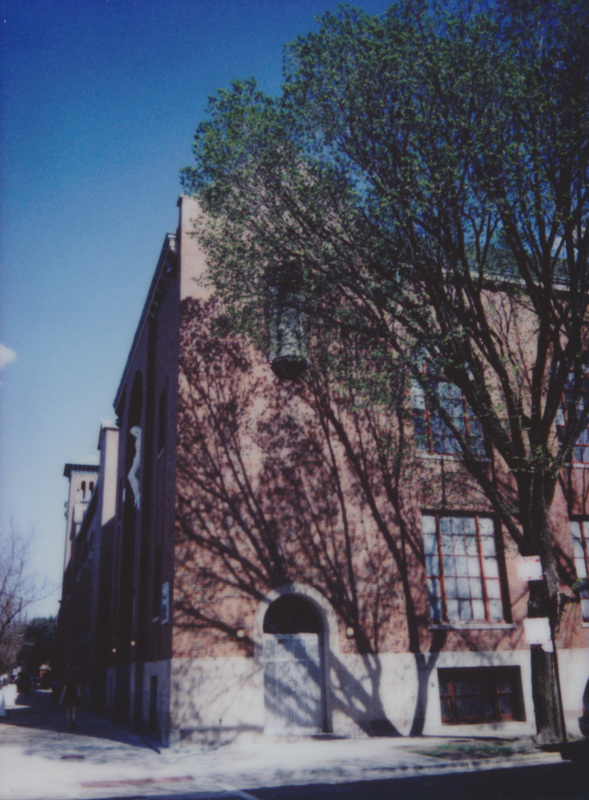 The low-ISO film for SX-70 cameras does great in the bright light, with excellent contrast and deep blacks. 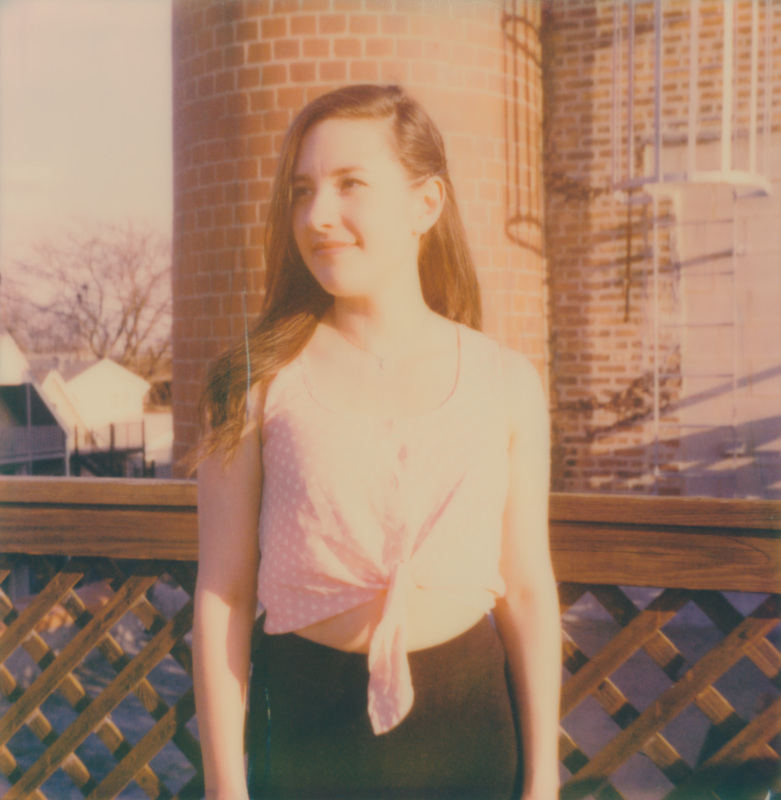 The Polaroid 680’s image seems to be color-shifted to warmer tones more, with less contrast. Much of the difference in exposure may also be due to the flashbar of the 680, which allows it to fill in detail in shadows near the camera. 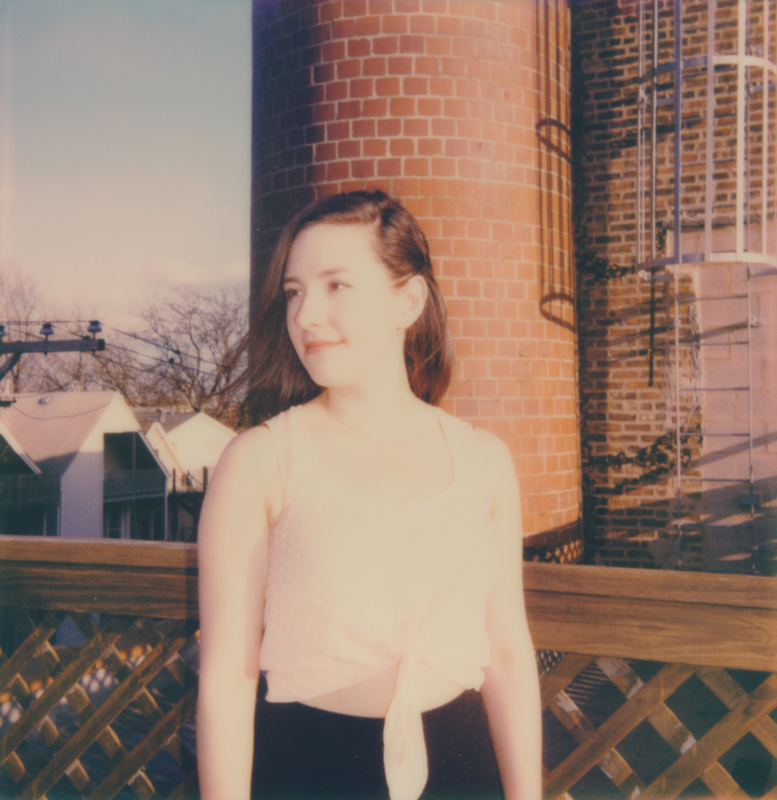 The sky behind the subject looks great with lots of detail in the SX-70 image, while it’s barely visible in the 680. In the indoor portrait test, the SX-70 Sonar couldn’t find enough light to even allow for it to take a picture. 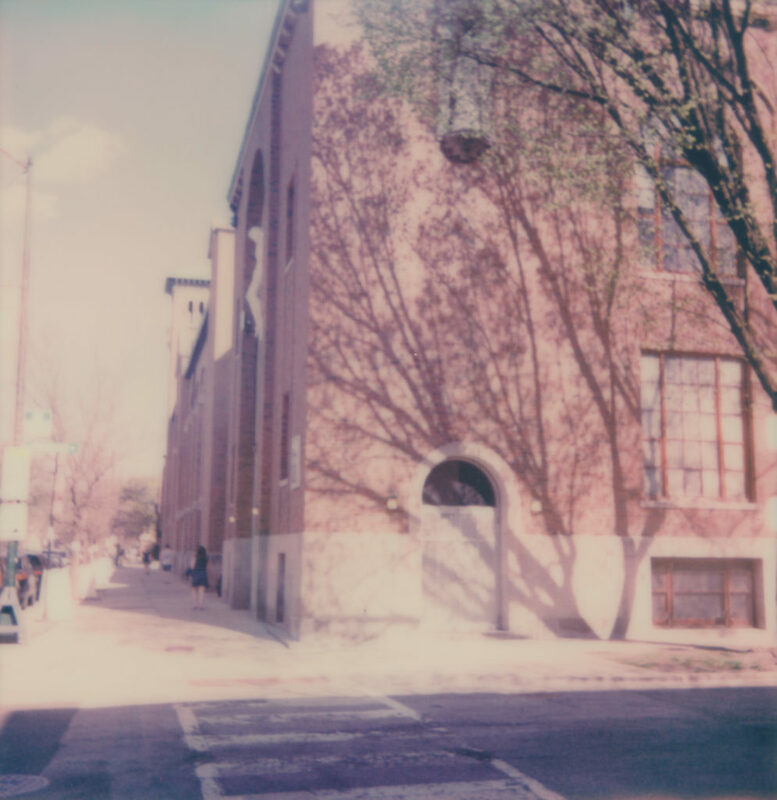 Despite fairly bright continuous lighting from multiple lights and a large window, the SX-70 refused to work. 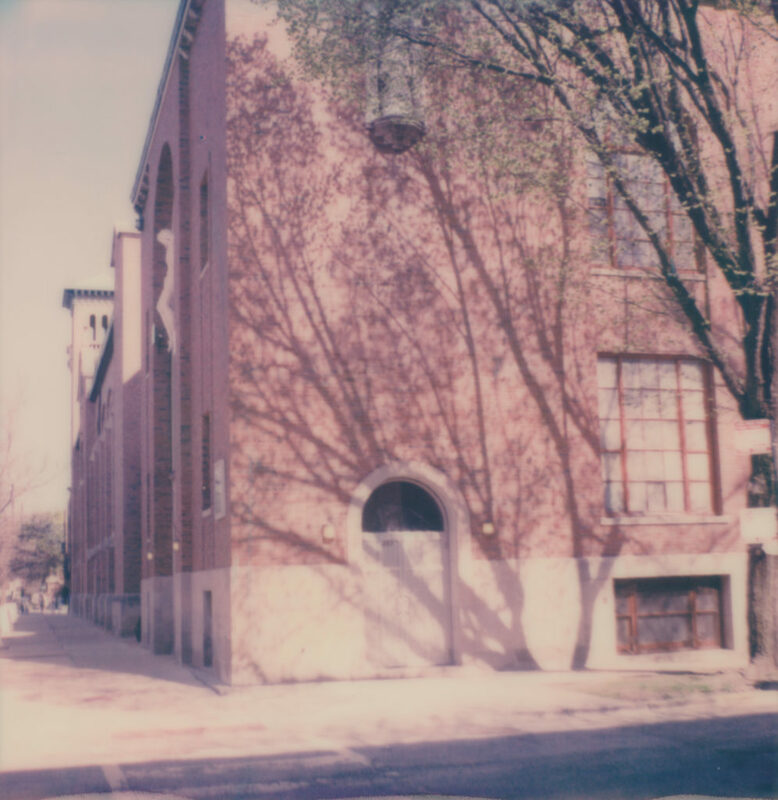 There is a strange issue that I’ve run into repeatedly with SX-70 cameras where even if there’s enough light to take a picture, if the exposure sensor doesn’t see it, the camera spazzes out completely. The shutter will only fire halfway, and you have to physically reset the camera by halfway collapsing it, then hitting the shutter again to fix it (all the while wasting at least one picture). Even with a flashbar this problem tends to persist, which is why the SLR 680 wins by default. In nearly every type of lighting condition, the versatility of the 600 type film puts the Polaroid SLR 680 on top. However, if you’re only shooting outdoors in very bright conditions, the SX-70 Sonar is still an excellent camera. 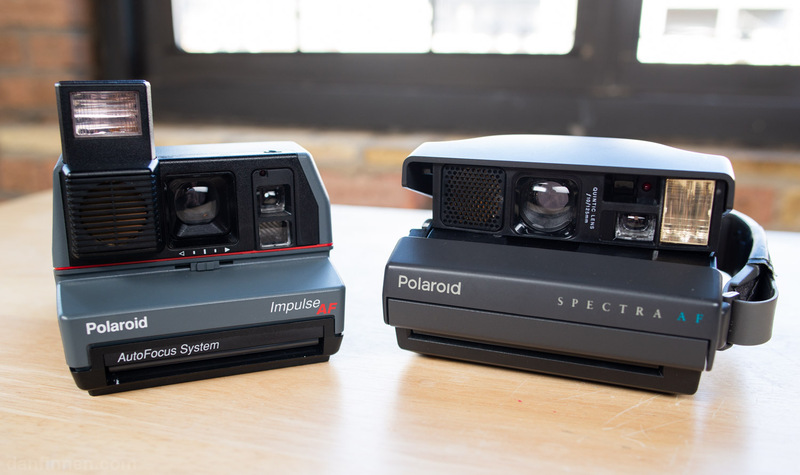 It’s one of Polaroid’s best AF 600 type cameras versus one of Polaroid’s best Spectra cameras! Both the Impulse AF and Spectra AF feature sharp lenses with autofocus, but the Spectra AF uses a slightly wider film type. Both Spectra and 600 type Polaroid film share similar chemistry and sensitivity despite being different sizes. Theoretically, both of these cameras should turn in very similar results. So how does it shake out? In the outdoor landscape test, both of these cameras turn in predictably similar results. The Impulse AF image seems a bit sharper, warmer, and the greens in the trees pops more. The wider Spectra AF image is, well, wider, and a bit redder, but still fairly sharp. The outdoor portrait test results are interesting. 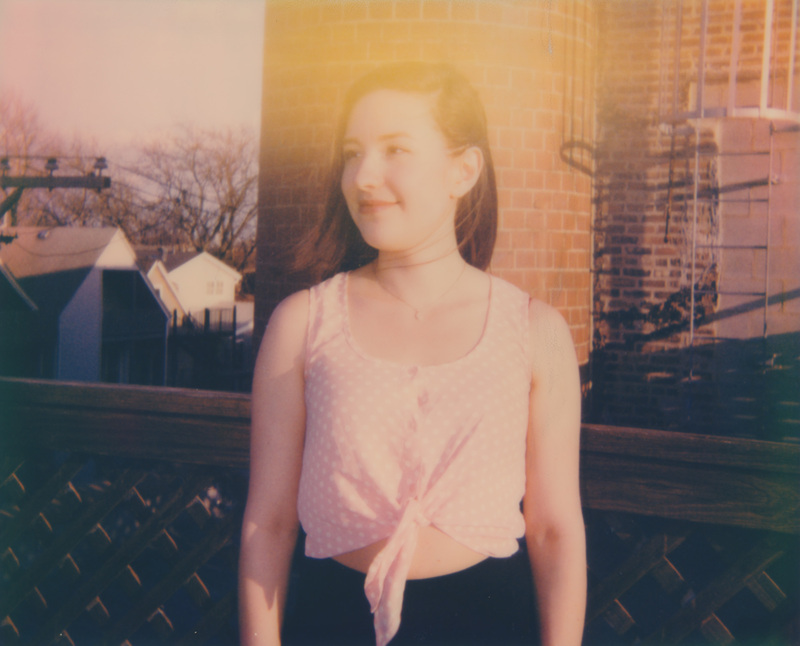 Both images look almost exactly the same, except the Polaroid Spectra AF image shows some sort of light leak-like effect on the top half of the image. 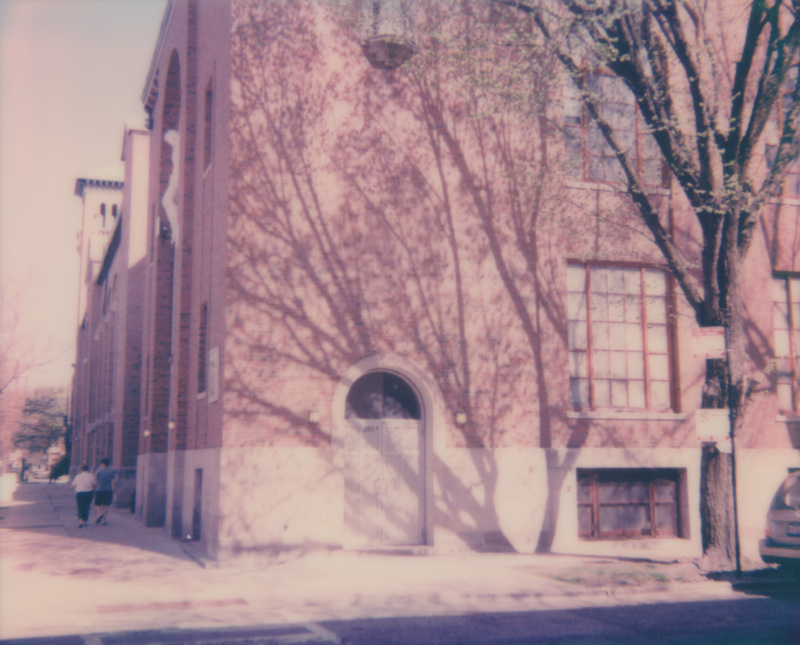 This is what older Impossible Project film used to look like if you didn’t use a ‘darkslide’ (basically a dark cover that one taped to the front of a camera to protect the image from light when it first popped out). I didn’t use a darkslide on either the Spectra AF or Impulse AF for this test, as you don’t really have to anymore with current Polaroid Originals film, so I’m not sure why the Spectra AF was affected. After doing this test, I made sure to put a darkslide on the Spectra AF for the landscape test and it seemed to solve the problem. In case you’re wondering, I took three images in the outdoor portrait setup with the Spectra AF and they all had this kind of light leak. Other than the light leak, both images look great. The Impulse AF is one of the most well-exposed shots from this entire test, and I actually enjoy the look of the light leak on the Spectra AF image. I’m sure if I used a darkslide on the Spectra AF, both of these images would look nearly identical. The moral? We still need to use a darkslide if we want to shoot a Spectra AF outside. In the indoor test, the Spectra AF image, however, delivers a pinkish color shift, while the Impulse AF looks more neutral and true-to-life. Also, the Impulse AF image seems just a hair overexposed compared to the Spectra AF. I’m chalking up most of these color differences here to the film rather than the cameras. It appears that at the time of this test, the Polaroid Originals film for Spectra cameras acts a bit more like older Impossible Project film, while Polaroid Originals 600 seems to have a newer chemistry. This would make sense, as 600 type film is far more popular, but this is also just speculation. Nothing about this is exact, and it could just be where each of these packs sat in a warehouse that caused the differences. I would note that both cameras did an excellent job, and certainly produced more consistently sharp results than their cheaper fixed-focus 600 brethren. Now let’s see what Fuji Instax does with these scenes. So far we’ve only been looking at current-gen (2018) Polaroid Originals film, so these Fuji Instax shots are a big change. As we’ll see, Fuji Instax renders colors completely differently than Polaroid Originals. Whether or not you like how they look is entirely subjective, which is why I chose to pit two Fuji formats against each other first. 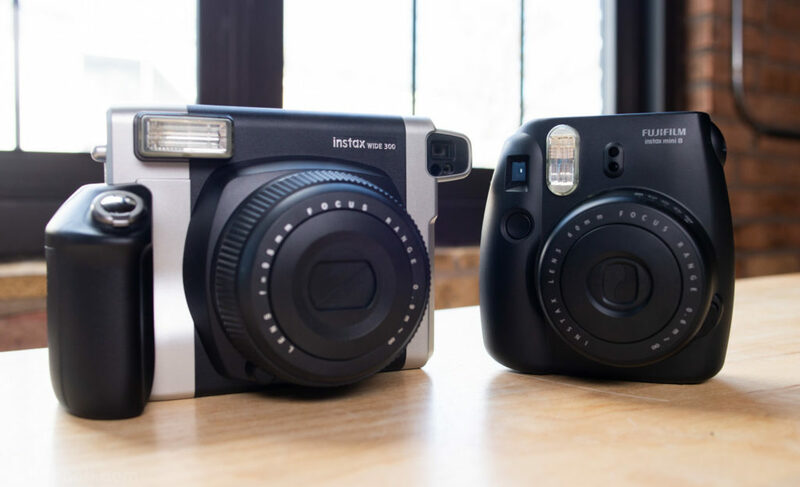 Instax Mini film is exactly one-half the size of Instax Wide, but shares the same chemistry. The big differences are going to be how well the tiny Mini format is able to retain detail, as well as how well each respective format’s cameras work. Instax Mini is represented by the extremely popular Fuji Instax 8 (which is the same as the 9), and the Fuji Instax Wide world is represented with the Fuji Instax Wide 300 camera. While the mini line has a wealth of awesome cameras, the Instax Wide world is limited to only a few crummy ones. The Instax 300 is the least bad of them. Right away we can see the huge difference between Polaroid Originals and Fuji Instax cameras in the outdoor landscape shot. Colors are much more saturated and accurate, with a blue sky and reddish building. Both cameras do a decent job with exposure, with the Fuji Instax Wide 300 being a bit too bright. The Instax Mini is sharp, but the small size of the frame makes it look a bit blurrier when compared to the Fuji Instax Wide and Polaroid frames. Both of these images look closest to the digital control photo out of all the instant film shots. 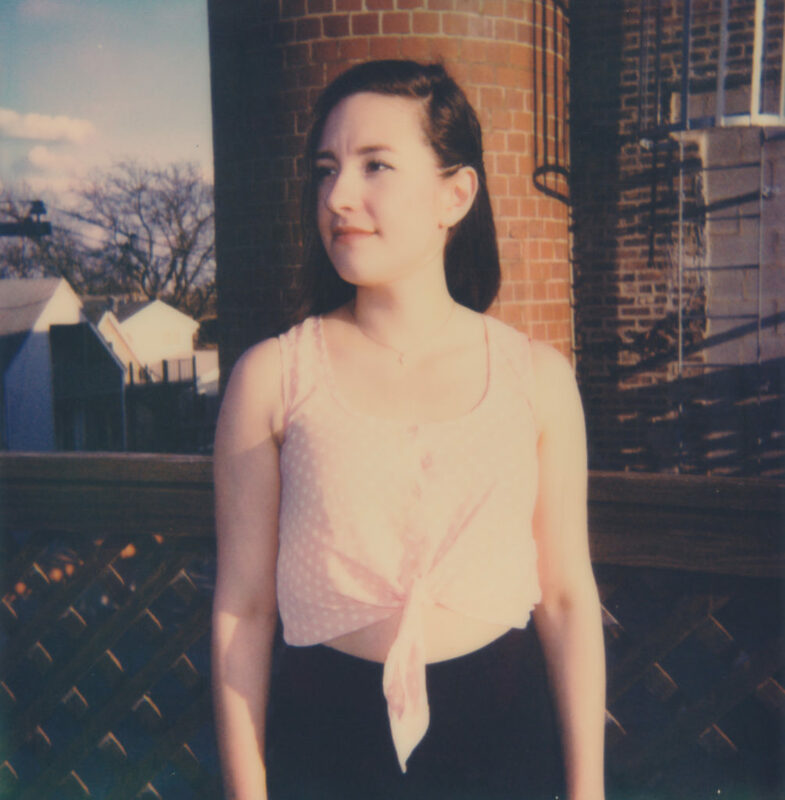 In the outdoor portrait, the Fuji Instax 8 once again does a better job of exposure than the Instax Wide 300. This is consistent with my experience with both cameras; for some reason the Instax Wide 210 and 300 seem to regularly struggle with exposing a scene properly. The Instax Mini 8 image is spot on with great colors, whereas the Instax Wide 300 image is a bit blown out, especially in the shirt. Flash was left on for both photos to act as fill. Once again, the small size of the Instax 8 frame makes it seem a bit softer when scanned and blown up, but the Instax 300 image also seems disappointingly soft. In the indoor photo setup, the Instax Mini 8 is in its element. The subject is well exposed and as sharp as the small frame will allow for. I often recommend using Fuji Instax Mini cameras to document parties, weddings, and events because it’s an affordable format and fairly inexpensive compared to everything else in the instant film world. The Instax Wide, on the other hand, reveals one of its biggest flaws here: close focus. 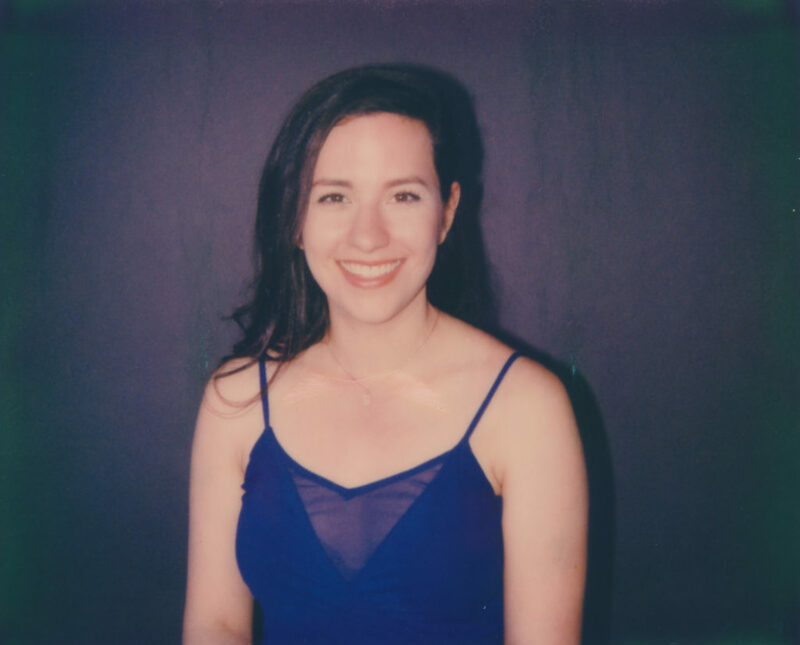 Trying to take a standard portrait with the same framing as the Instax Mini is an exercise in blurry frustration. Move the subject back, and it’s fine, but now the subject is too small in frame. I include both Instax Wide 300 shots to illustrate this point. This is the biggest failing of the Instax Wide 210 and 300, and the reason why I always end up regreting bringing it out for portraits. Overall, I’d say the Instax Mini 8 is a clear winner here despite the limitations of the tiny frame size. Hopefully someday the Instax Wide format will get the camera it deserves. As I was writing this article, Fuji announced the SQ6, the first fully analog Instax Square camera. It’ll be interesting to see how this new format shakes up the world of Fuji Instax film, and I’ll be sure to do a thorough review as soon as I get my hands on it later this month. Now that we’ve done direct comparisons between many similar cameras, let’s judge Polaroid Originals and Fuji Instax side-by-side and see how they compare. Generally, Instax film is much more color accurate than Polaroid Originals, with all colors being captured (mostly) equally. To my eye, Instax generally has as subtle blue cast to it, which makes it feel a bit ‘colder.’ Instax comes from the same technology that vintage Polaroid film comes from, and is very stable and refined. Polaroid Originals, on the other hand, is the latest generation of the Impossible Project films, and is inherently unstable and wild. I love how it looks, but it’s definitely not accurate. Both films are an artistic tool, so you simply need to pick the one that helps you achieve what you want to do. The outdoor landscape shot is a great showcase in how the two film formats are different. The Polaroid Originals shots are bathed in a dreamy, warm glow, while the Fuji Instax shots are more color accurate, and feel retro in their own way. The Instax image also seems to me to be more contrasty, especially in the Instax Mini sample. 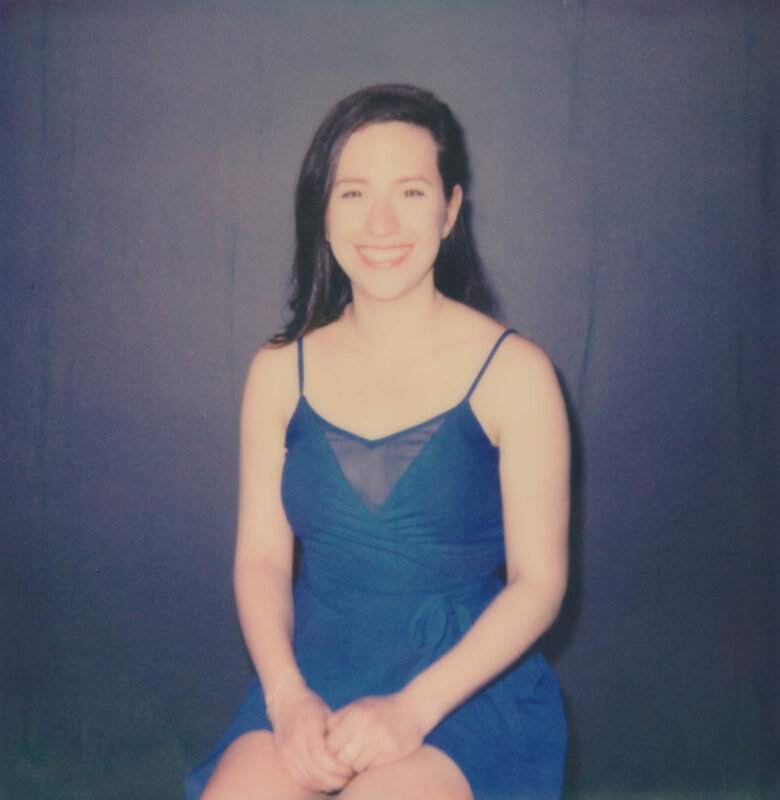 In the outdoor portrait setup, the Fuji Instax shots repeatedly demonstrated a superior ability to render the color blue. 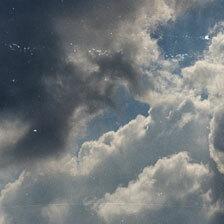 The clouds and sky are much more easily discerned than in the warmer Polaroid Originals versions of the shots. However, I again emphasize how subjective all this is, because I actually like how the Polaroid Originals film rendered this scene. I wanted to convey the late afternoon light, and the more extreme color shifts of the PO film achieve this goal. The indoor studio setup shows exactly what kind of color shift each film is bringing to the table. 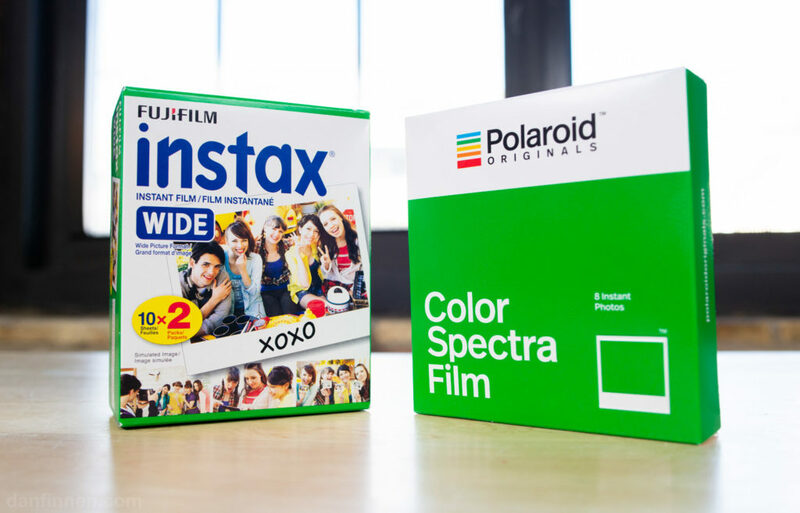 The backdrop is neutral dark gray, and the Instax camera gives it a blue shade, while Polaroid Originals shifts it further on the red/yellow side of the spectrum. I think warmer tones tend to be more appealing when it comes to portraits, but that is purely subjective. Speaking of subjective, Polaroid Originals film shows lots more opacifier and chemical artifacts across many of the images I took for this teset. Blue streaks, spots, and roller irregularities regularly pop up in Polaroid Originals shots, while Fuji Instax film almost never shows any of these issues. It’s hard to call these ‘defects’ however, as they’re one of the reasons why I love Polaroid Originals film so much. Vintage Polaroid Time Zero film was famous in its own day because of its wild ‘defects,’ which made it a favorite among artists. In my opinion, if you really want perfect accuracy, digital is the way to go. After this test, I still stand by my standard assessment of Fuji Instax vs Polaroid Originals. Fuji Instax Mini is a great format for parties, weddings, and other events, and Polaroid Originals is my go-to for all artistic photography purposes. Fuji Instax Wide desperately needs a decent camera, and until it gets one, doesn’t really fit in anywhere. The venerable Polaroid SLR 680 is the most expensive camera in this test, and it is also by far my favorite. However, how does the dirt cheap OneStep CloseUp truly compare? Is the SLR 680 so much better that it’s worth paying hundreds of dollars rather than tens of dollars? Both of these use the exact same film, so the differences we see all come down to the cameras themselves. Just to reiterate, the Polaroid OneStep CloseUp is a fixed-focus box type rangerfinder camera, similar to countless other plastic cheapies Polaroid pumped out over the decades under countless names. 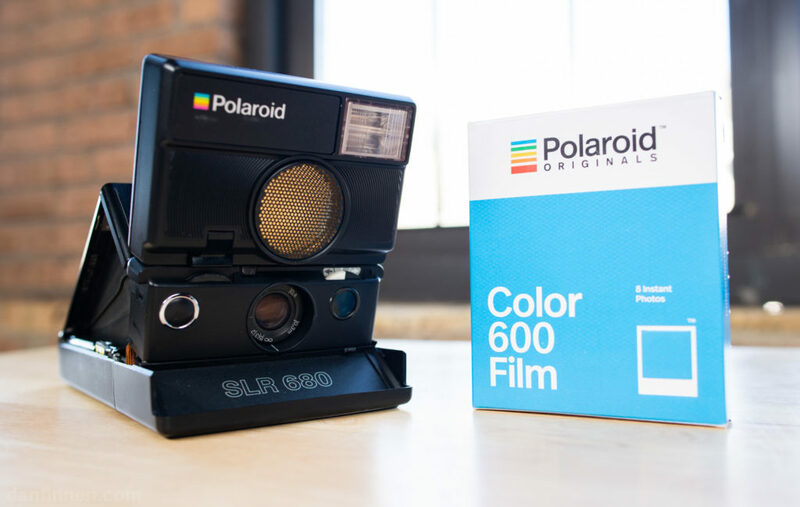 The Polaroid SLR 680 is the ultimate refinement of Edwin Land’s incredibly innovative SLR design, and features a lens that can be manually or auto-focused. In the outdoor landscape test, both shots are indistinguishable. 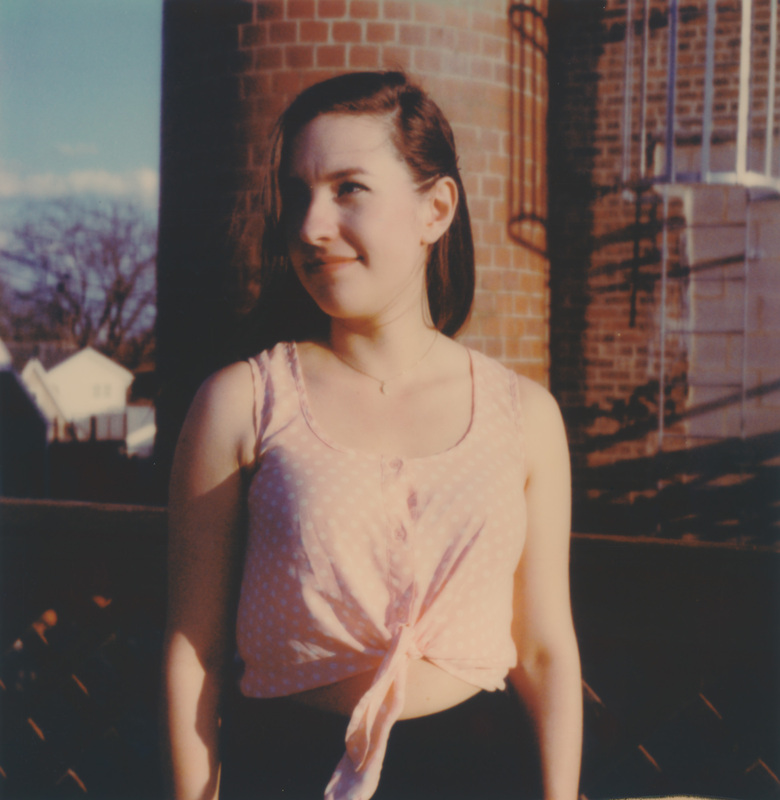 In fact, the OneStep CloseUp has a bit more contrast and I think is slightly superior to the SLR 680 image. These wide landscape shots allow the lens to focus at infinity, so the difference between a lens that can autofocus and a fixed focus doesn’t come into play as much with this kind of shot. I expected distortion to be stronger with the fixed focus lens cameras (it’s why I took a picture with strong vertical lines), but the minor pincushion distortion really isn’t noticeable unless you look for it. 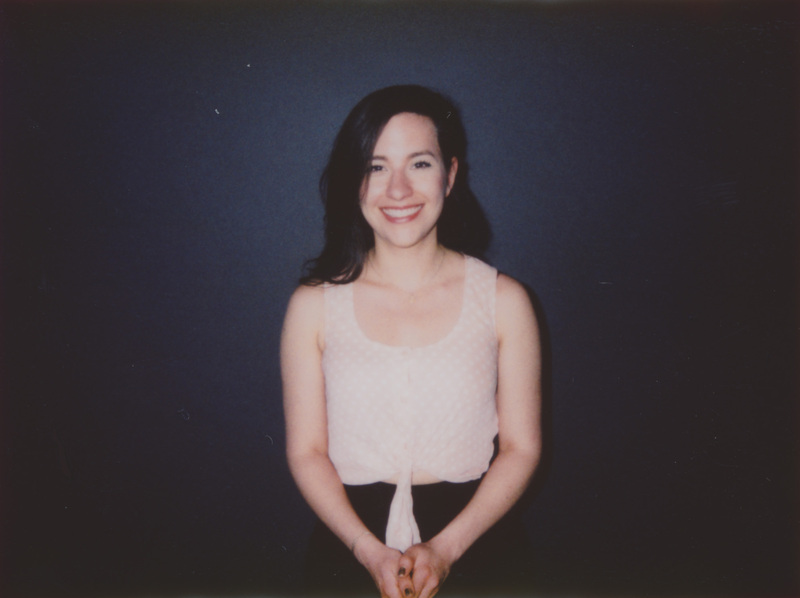 The SLR 680 doesn’t have any visible distortion from what I can tell. 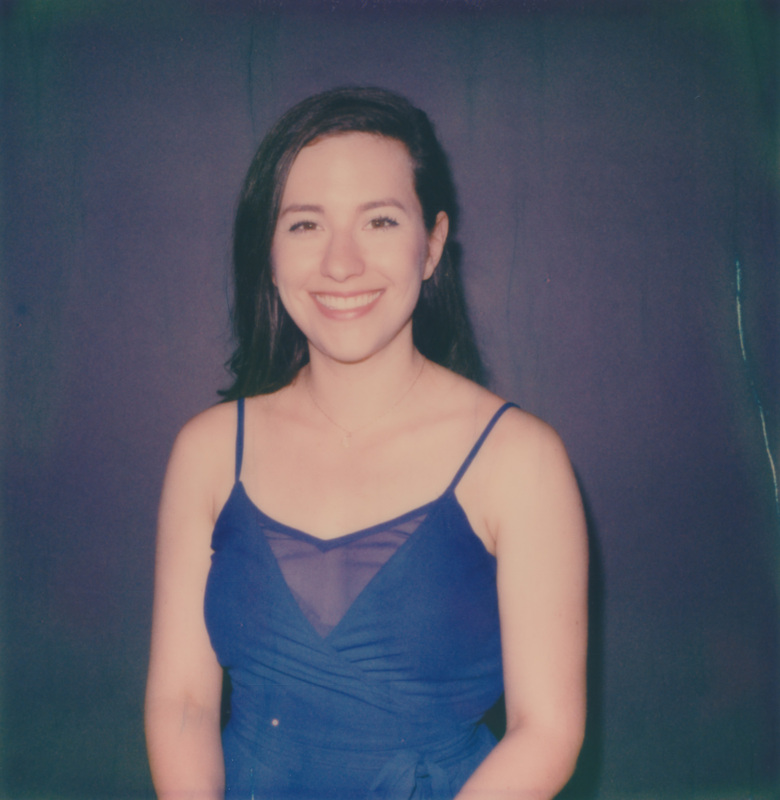 In the outdoor portrait test, the results are a bit skewed from the SLR 680 shot showing a ‘light leak.’ The OneStep Closeup I used has a frog tongue adapter installed, which protects the image when it pops out of the camera. My SLR 680 does not have one, so the film was ‘damaged’ by light hitting it when it popped out of the camera. Modern Polaroid Originals film opacifier should protect the image when it pops out of the camera enough to not require a darkslide or frog tongue adapter, but in bright, direct sunlight it looks like it’s not a bad idea to keep using one. Why did I not mention that I added a frog tongue adapter to the OneStep Closeup before? Well, the OneStep 2 that it was up against also has its own frog tongue adapter, so they’re both equal there. Either way, in this setup, both the SLR 680 and OneStep CloseUp images look great and are exposed well. The 680 blurs out the background a bit, which is nice, something that the fixed focus lens of the CloseUp can’t do. Once again, the wheels come off the OneStep CloseUp inside with a portrait shot. 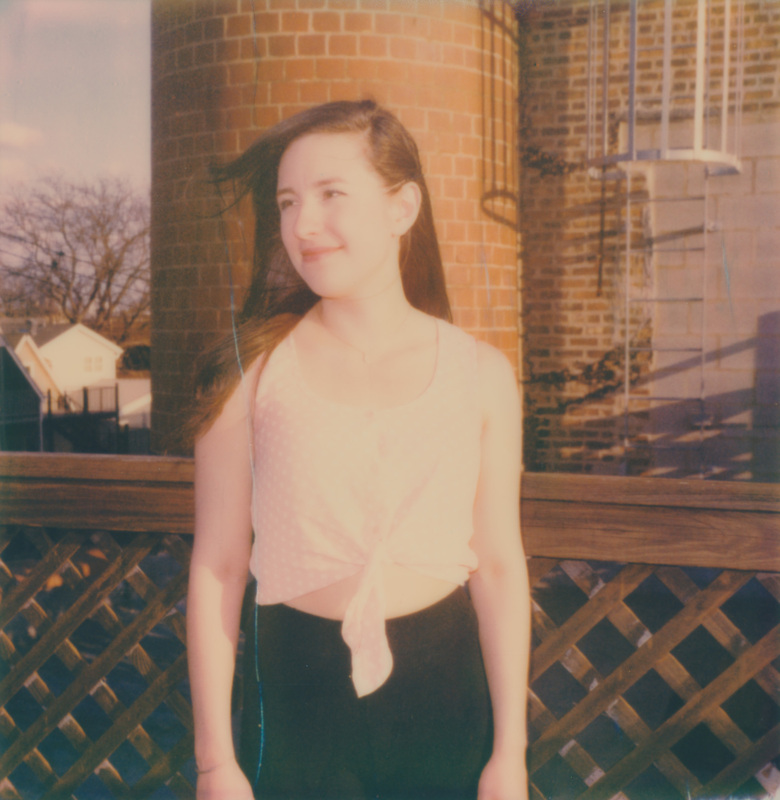 The OneStep CloseUp is blurry and overexposed, while the SLR 680 image looks great. The OneStep CloseUp behaves similar to the Instax Wide 300, where it gets real grumpy when the subject is too close to the camera. However, ‘too close’ is usually exactly where I want my subject to be in these kinds of situations. Overall, as you can see, there are many situations where the cheap Polaroid OneStep CloseUp is just as good as the expensive SLR 680. 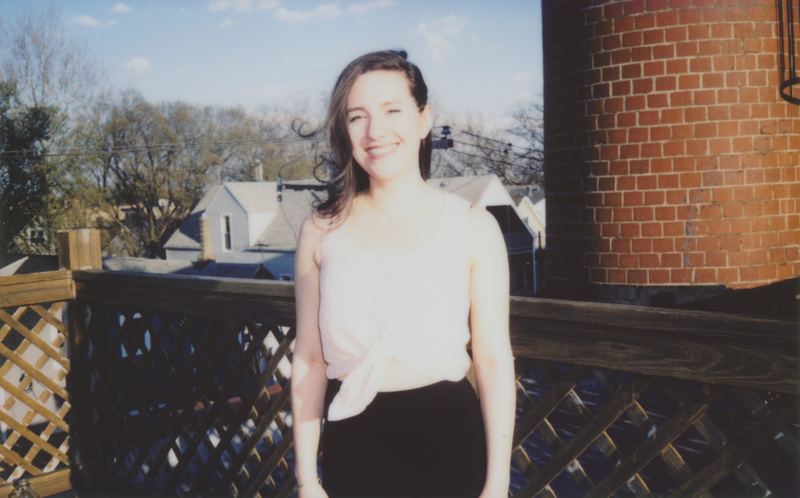 I’ve purchased several OneStep CloseUps in my day for 10 USD or less at flea markets and garage sales, while I paid hundreds of dollars for my SLR 680. Ultimately, the SLR 680 is a better camera, and if you shoot as much as I do it’s totally worth it. However, if money matters, don’t lose sleep over using a cheap 600 type camera. The OneStep CloseUp is the model I used here, but you can extrapolate the results to hundreds of other cheap 600 type cameras out there. One Camera to Rule Them All: What Are My Favorite Images? These results are entirely subjective, as what might look terrible to one artist’s eye will look great to another. That’s why I provided the raw scans and images above so you can make your own call on which ones you like best. However, this is a camera shootout, so there’s got to be a winner, right? So after all is said and done, which results do I like best? In the landscape test, it’s a tie between the Fuji Instax Mini 8 and Polaroid OneStep CloseUp. This came as a complete surprise to me, because those are by far the cheapest cameras I tested. However, they both turned in contrasty, great-looking images that beat out everything else. In the outdoor portrait test, my personal taste overrules what would be the technically ‘best’ images. 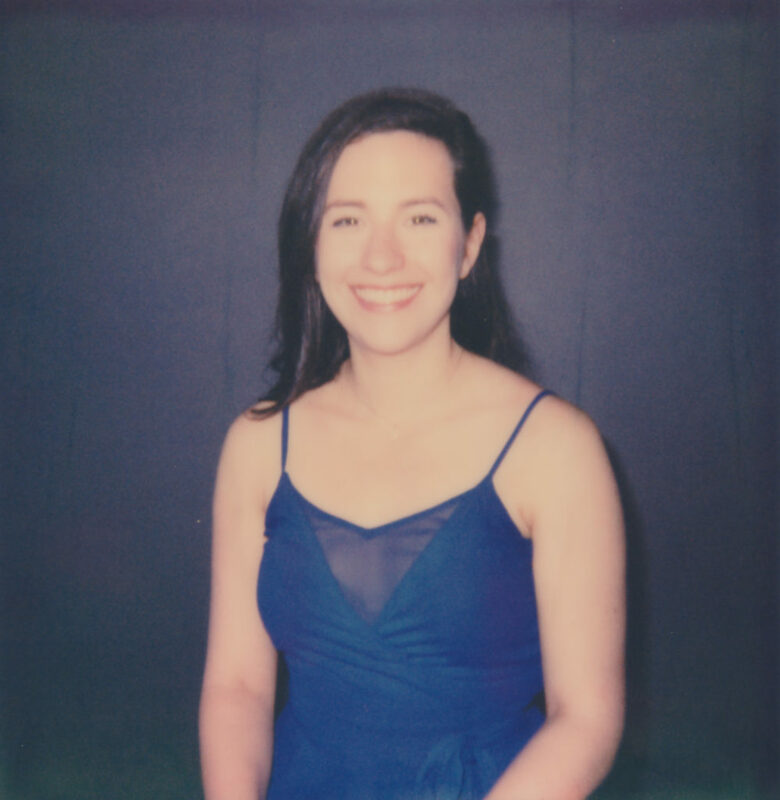 I really like how the ‘light leak’ of the SLR 680 image compliments the subject, and it grabs my attention before all the others. I think the Polaroid Impulse AF comes in second with a strong image in every way without any of the light leak issues. For the indoor portrait test, the SLR 680 runs away with it. It’s by far the sharpest image of the bunch, even beating out the other autofocus Polaroid cameras. Thanks to the through-the-lens viewfinder, composition is much easier and more accurate than what I could achieve with any of the cheaper rangefinder type cameras. 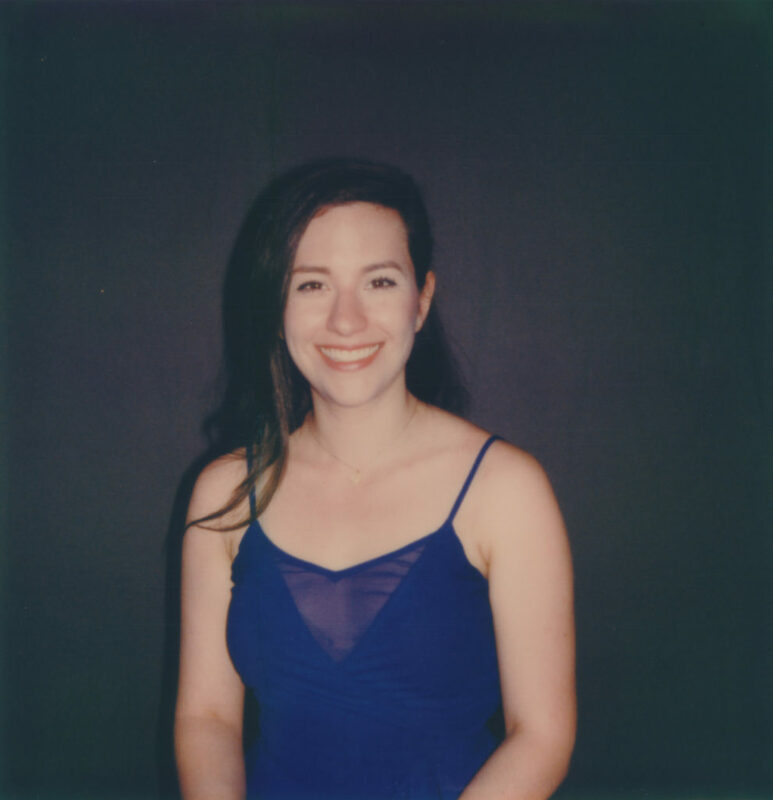 I know I’ve spent a lot of time on this site gushing about how great the SLR 680, but it really does have it where it counts. However, as I’ve said in this article before, it’s not so much crazy better than the other cameras that you should worry about using a fixed-focus box type Polaroid if that’s what you have access to. Alright, if you really want to get into the gritty technical details, these next three sections are for you. I scanned everything using the same methods I outline in my article on how to scan Polaroid film. I used a CanoScan 9000F flatbed scanner with the default macOS scanning software. Scans were done at 2400 dpi with ‘billions of colors,’ which is macOS’s way of saying ‘bit depth.’ I cropped out the borders in Adobe Lightroom so they wouldn’t be a distraction, then exported the images as JPEGs. Originally, I had planned on doing some limited color correction in post to make the images look more like they appear as a physical object, but I ended up just using the raw scans. The scans are just as they are out of the scanner, with no color or exposure adjustments to introduce as few variables as possible. Generally, the scanning process reduces contrast and makes blacks look lighter than they do on the image themselves. Since Polaroids are physical objects, the kind of light they’re viewed in has a huge effect on their perceived color and contrast. Instant film isn’t subject to the same scientific precision we demand from digital SLRs and mirrorless cameras, so I didn’t bother with test charts and the such. I framed up everything approximately the same way, taking a step back and forth as needed. If you want scientific accuracy, the unpredictable, wild world of film probably isn’t for you. 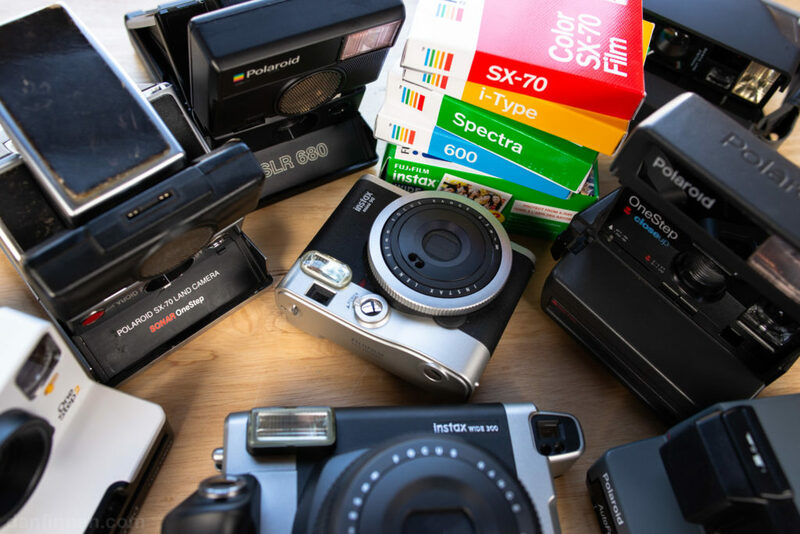 Besides the Fuji Instax cameras and the OneStep 2, all of these cameras are decades old. 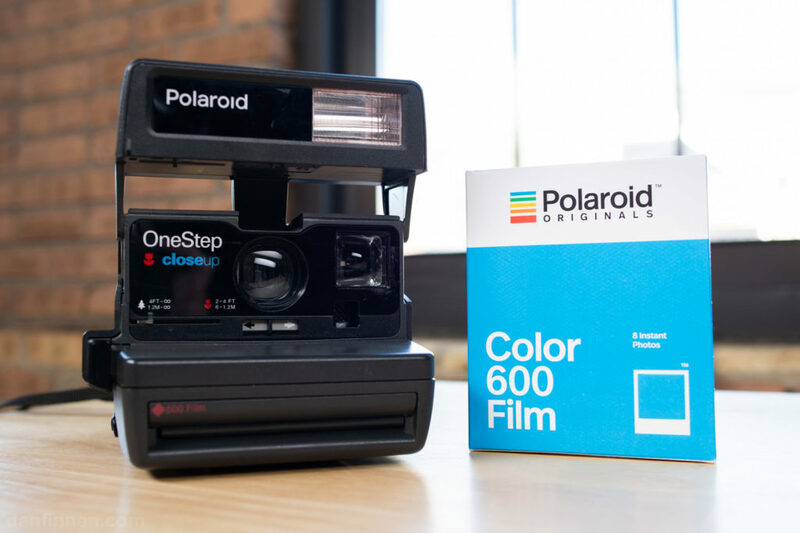 That means that there is significant variance between cameras, meaning that one Polaroid OneStep Closeup might perform differently than another simply because of how it was stored or used in the past ten, twenty, thirty years. To mitigate this problem, I used cameras that I’ve shot with extensively, so I know how they generally work when everything is going right. Also, I have several units of cameras like the OneStep Closeup, so I can make sure results are consistent with my experience with that multiple units of that particular camera. I tried to get a comprehensive range of cameras and film for this test, but there are a few notable models that are missing. 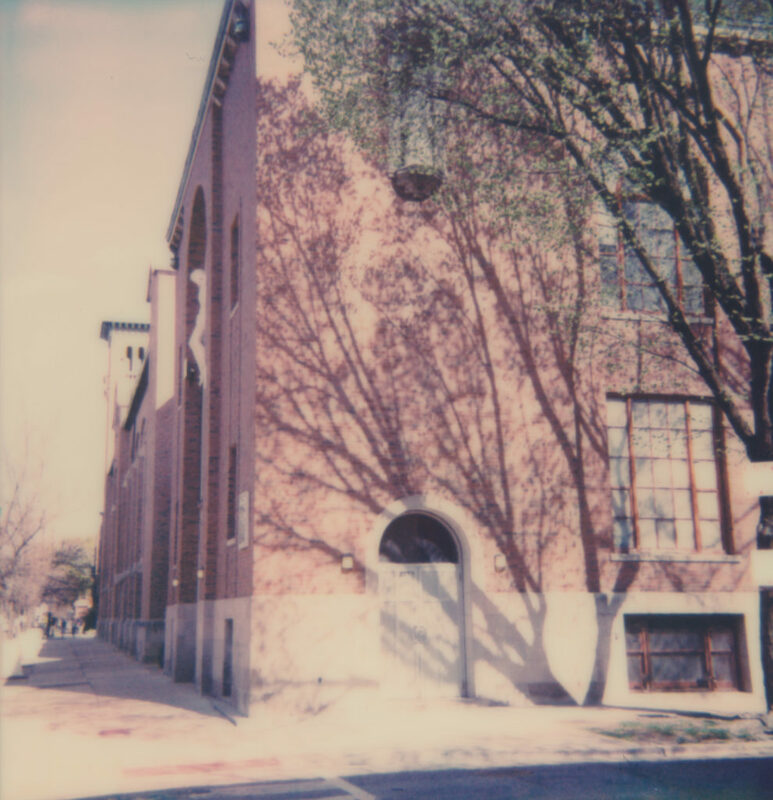 SX-70 cameras are only represented by the excellent SX-70 Sonar in this test, but this is not by choice. I own and have shot with countless SX-70 plastic box-type rangefinders, including the iconic rainbow stripe OneStep, but they have all died on me over the years. I have a drawer that is SX-70 graveyard, including all kids of fixed-focus, manual-focus, and autofocus camera variants. I would’ve loved to use them, but the advanced age of SX-70 system cameras make them notoriously unreliable. For most people, 600 type cameras are a much better fit, and are infinitely easier to work with. MiNT makes some awesome customized variants of SLR Polaroid cameras, but unfortunately I do not own one. However, the fundamental pieces of MiNT cameras are the same as the two Polaroid SLRs that I tested. The focus of this test was color film, so I didn’t shoot any black and white to compare. I have plans to do a comparison test between Fuji Instax Monochrome and Polaroid Originals black and white though. However, you can assume that the observations I’ve made in this article about sharpness generally also apply to black and white films. I decided not to include the Impossible Project I-1, which despite being an innovative camera, has largely been discontinued. The OneStep 2 is a much better representative of I-Type, and seems to be far more popular. I also already have a much more detailed I-1 shoot test you can check out if you’re curious about that specific camera. There are tons of Fuji Instax cameras out there, especially ones made by other companies ranging from Lomography to Leica. I included a camera for Instax Mini and Instax Wide, but didn’t bother to get into the tiny differences between individual cameras like I did with Polaroid. Also, if you’re interested in the Lomo Wide camera I have a test I’ve already done with the camera that you can check out. I have not gotten my hands on the Lomography Instax Square camera, so I can’t speak for it. Needless to say, I didn’t bother with peel-apart, as that format is on its way out and isn’t nearly as common as the formats represented here. 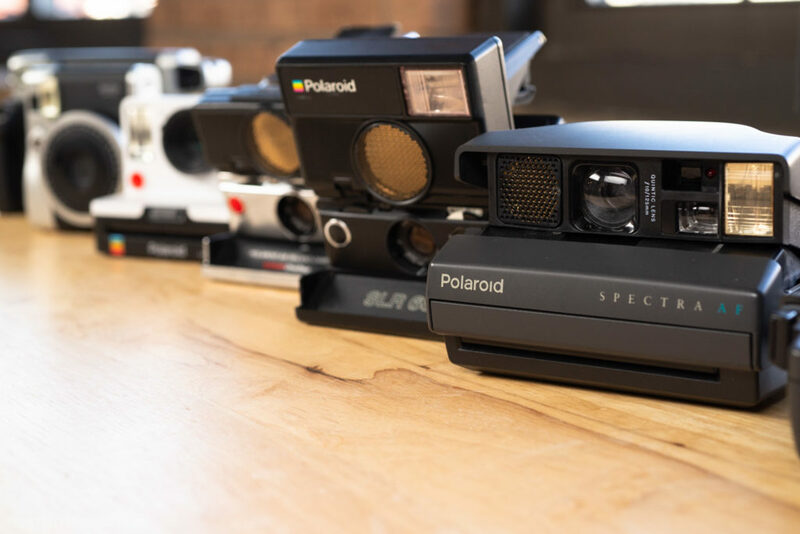 Finally, all of the Polaroid cameras are being tested with brand new Polaroid Originals film, not the vintage Polaroid film of yore that originally went with these cameras. Polaroid stopped manufacturing film somewhere around 2008, and the remaining film has long expired and costs an insane amount of money even if you can find it. I have my own small stockpile of vintage Polaroid, but I’m certainly not going to be using it for a camera test. 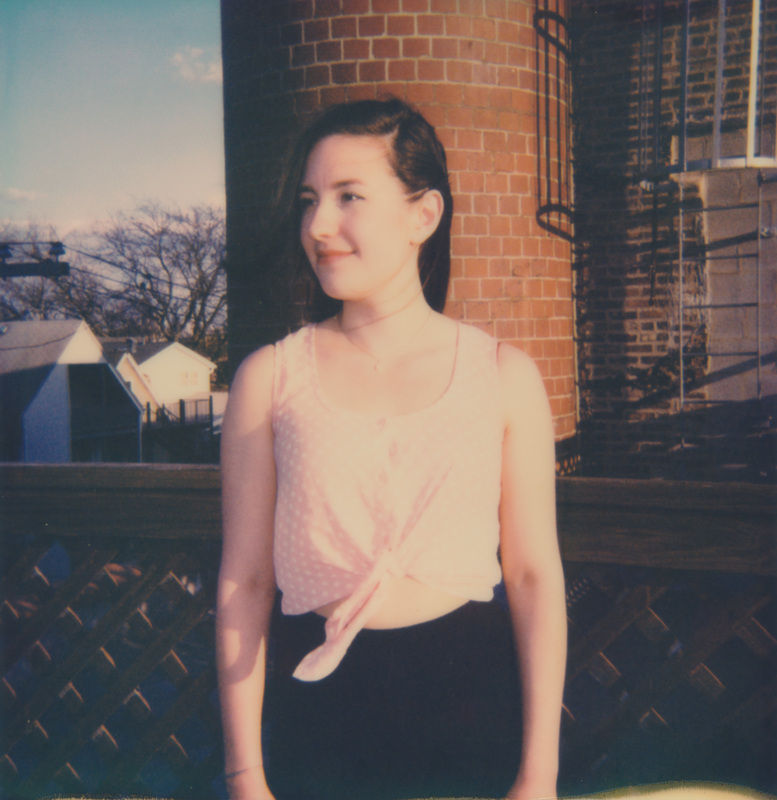 From my experience, Fuji Instax tends to look and act like vintage Polaroid more than Polaroid Originals film. However, I still vastly prefer the wild colors and unpredictability of Polaroid Originals over Fuji Instax. Many of the differences between cameras that use Polaroid film are pretty subtle. 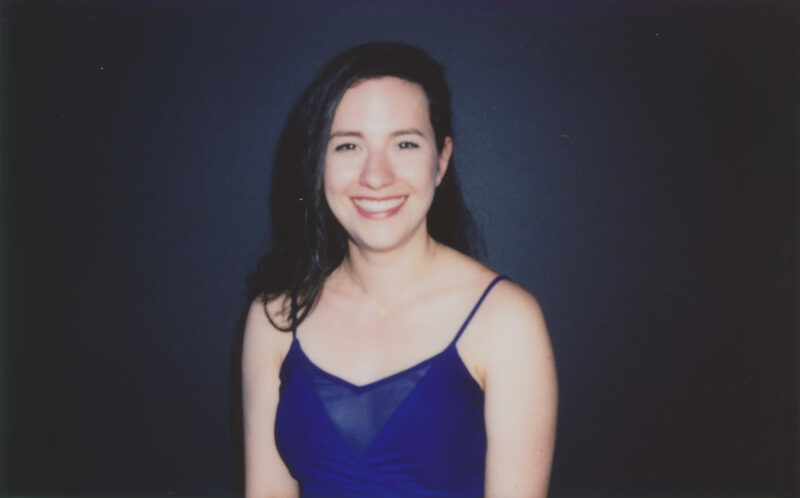 If you only have a Polaroid OneStep CloseUp, you can rest easy that an ultra-expensive SLR 680 isn’t really going to make your photos wildly different. The biggest decisions to make is whether or not you like the Fuji Instax or Polaroid Originals ‘look’ better, then go from there. 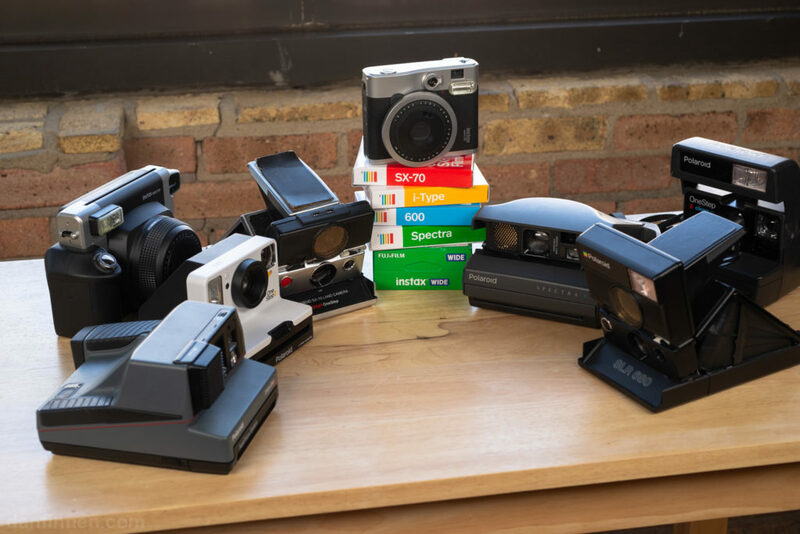 There are certainly differences between Polaroid cameras, but you should pick one based first on your budget, then on usability. 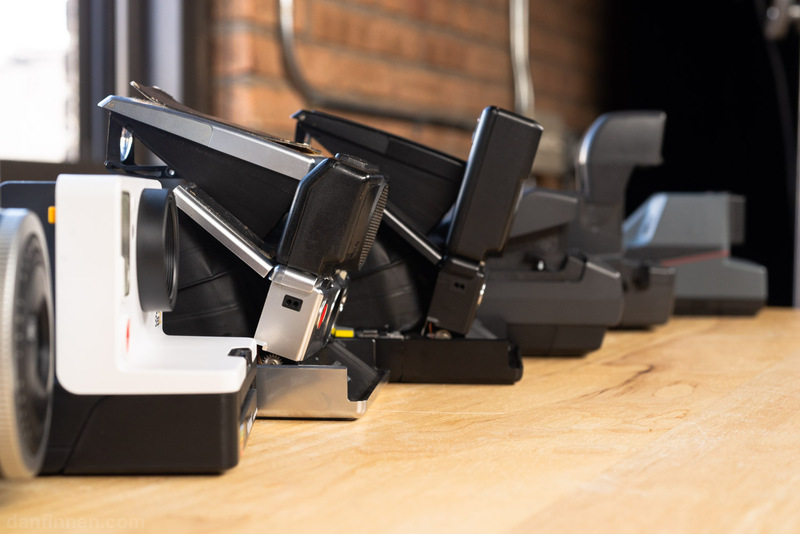 As you pay more for the OneStep 2 or a Spectra AF, what you’re getting are more controls. The SLR 680 earns its keep by its amazing ergonomics and quality, but at the end of the day, many of my best photos were also taken on dirt cheap vintage 600-type cameras. I think most beginners should avoid SX-70 cameras unless collecting is more important than photography (SX-70 cameras are beautiful, and I have a few decorating my desk). 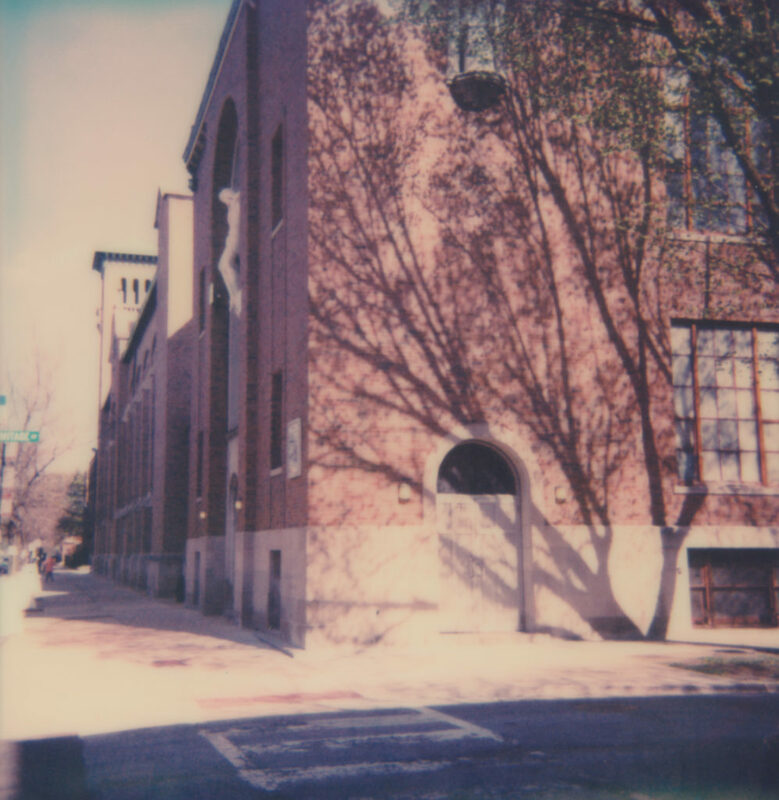 However, shooting SX-70 is difficult, and the cameras are fickle. 600 and Spectra has a much higher ISO/ASA and is far easier to use as a result. Also, these cameras tend to be newer, which helps with reliability. Vintage SX-70 Time Zero was incredible, but these days Polaroid Originals SX-70 film doesn’t really look different enough from 600 to justify the added difficulty. If you’re ready to pick out your own camera, check out my Fuji Instax and Polaroid camera buying guides. Also, if you want to keep up with all that’s new in the world of instant film, subscribe to my YouTube channel and sign up for my monthly newsletter. Much thanks to Kelly Combs for modeling for this test!